Enjoy a relaxing afternoon with this Relaxing Tea Gift Set that contains white and green teas. A perfect gift for tea lovers who enjoy a cup of antioxidants Mao Jian white morning tea, then a cup of soothing Long Jing Green Tea as an afternoon tea and at the same time Pearl Jasmine Green Tea for dinner! 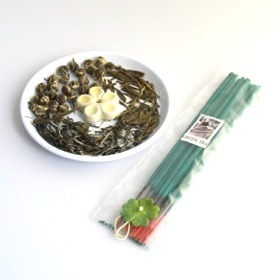 Relaxing Tea Gift Set is also complemented by a small pack of green tea insense sticks and an incense holder.